Paul McCartney in Audience Watching The Quarrymen! 6 Yes, But Did Paul McCartney Wear Glasses? 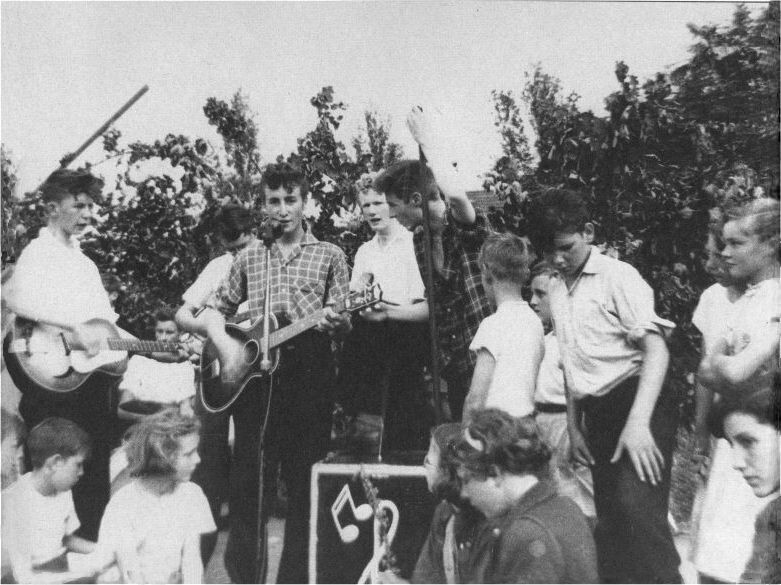 In this photo of the Quarrymen's 22 June 1957 gig we see John Lennon singing and what appears to be Paul McCartney in the audience looking on, in either glasses or shades. This photo of the Quarrymen (aka Quarry Men), by Charles Roberts, has been around for ages. Amongst numerous other Beatles books, it is included in Mark Lewisohn's 1992 book The Complete Beatles Chronicle and the companion book to the Beatles Anthology documentary, The Beatles Anthology, published in 2000. Which is to say, it's not a fake or in any way doctored. The photo is not as common as the one taken at the Quarrymen's 6 July 1957 gig at St. Peter's Church garden féte in Woolton (View it) where McCartney says he was introduced to Lennon, and where Lennon is looking straight at the camera. In the detail below, compare Paul in the Quarrymen photo (at 15) and (inset) Paul at 19 or 20. The chin, the nose, the mouth, the ear, the whole thing... and the sideways part of the hair on the back of his head! If it's not Paul, it's his doppelganger! Here are some various Quarrymen photos after Paul joined, around the same time. Folks have said he was "chubbier" at that time, but I think he's pretty much like the guy in the photo. Compare Paul's jacket in this photo, taken in the Summer of 1957 in Filey, with the one the guy in the Rosebery Street photo is wearing, also summer 1957! Filey is a seaside resort about 140 miles NW of Liverpool. Is this the jacket? It may or may not be the "white" jacket mentioned in the lore, but it definitely appears to be the same shade as the one in the Rosebery photograph. And, hey, the white shirt? And the haircut? It's definitely Paul at that 22 June 1957 Quarrymen gig, astride his bike, in either sunglasses or just glasses. The Quarrymen, with Colin Hanton (drums) and Len Garry (tea chest bass), 23 Nov 1957  Note Paul's jacket ... again! Some who are skeptical of the guy in the Quarrymen photo being Paul say that he was "chubby" at the time and they guy in the photo isn't. Paul may have had a chubby period, but the below photos show teenage Paul looking fairly trim. (Thanks to TheBeatlesBeat Website for a couple of these! As you'll see in this video, Dave, a helper at St Peter's Church, was apparently at the Woolton féte and says, rather definitively, that Paul "rode his bike" to the féte on 6 July. In the Quarrymen pic with "Paul", it would appear that he is perhaps standing astride a bicycle which, of course, would likely be the way he got to the Rosebery Street gig two weeks earlier. Yes, But Did Paul McCartney Wear Glasses? A bespectacled Paul McCartney  wearing glasses or perhaps sunglasses  is clearly present at the Quarrymen's June 22, 1957 gig on Rosebery Street. Many Beatles fans and experts aren't aware that Paul wore glasses and this perhaps is why Paul's obvious presence in the audience has been overlooked for 50 years. Friends of the singer say McCartney rarely wore glasses because it was part of his friend John's image. "He was always conscious that John was famous for his glasses," said one friend. "He felt that it was important to maintain their image and John's glasses were part of that. "His eyesight is also pretty good, so he didn't need to wear them much." Who knows whether or not Paul needed to wear glasses. Maybe it was just something cool to do, a la Buddy Holly (Lennon and McCartney were both huge fans and hugely influenced by Holly), or looking older (he'd turned 15 just 4 days before the Rosebery Street photo), or perhaps more intellectual and mature so as to appeal to the girls he was there to check out. This page was last modified on 20 July 2014, at 16:42.